Valencia is the capital of the autonomous community of Valencia and the third largest city in Spain after Madrid and Barcelona. Valencia is also Spain's third largest metropolitan area, with a population ranging from 1.7 to 2.5 million. The city has global city status.The Port of Valencia is the fifth busiest container port in Europe and the largest on the Mediterranean Sea. The original Latin name of the city was Valentia meaning "strength", or "valour", the city being named according to the Roman practice of recognizing the valour of former Roman soldiers after a war. Valencia was founded as a Roman colony in 138 BC. The city is situated on the banks of the Turia, on the east coast of the Iberian Peninsula, fronting the Gulf of Valencia on the Mediterranean Sea. Its historic centre is one of the largest in Spain, this heritage of ancient monuments, views and cultural attractions make Valencia one of the country's most popular tourist destinations. Valencia's charm lies in its architecture and many museums, churches and monuments. Major monuments include Valencia Cathedral, the Torres de Serranos was constructed by Pere Balaguer in the 14th century. These impressive towers once formed part of the defensive walls of the city. The La Lonja de la Seda (Silk Exchange) - is the site of the ancient local silk trade. The building was declared a World Heritage Site by UNESCO in 1996. The Ciutat de les Arts i les Ciències (City of Arts and Sciences), an entertainment-based cultural and architectural complex designed by Santiago Calatrava and Félix Candela. The Museu de Belles Arts de València houses a large collection of paintings from the 14th to the 18th centuries, including works by Velázquez, El Greco, and Goya. The Institut Valencià d'Art Modern (Valencian Institute of Modern Art) houses both permanent collections and temporary exhibitions of contemporary art and photography. The most famous fiesta in Valencia is Fallas, held each March, in which local areas build big papier maché models. They are mostly of a satirical nature and can be as tall as a few stories. Fallas is a spectacle of noisy festivities, music and fireworks. 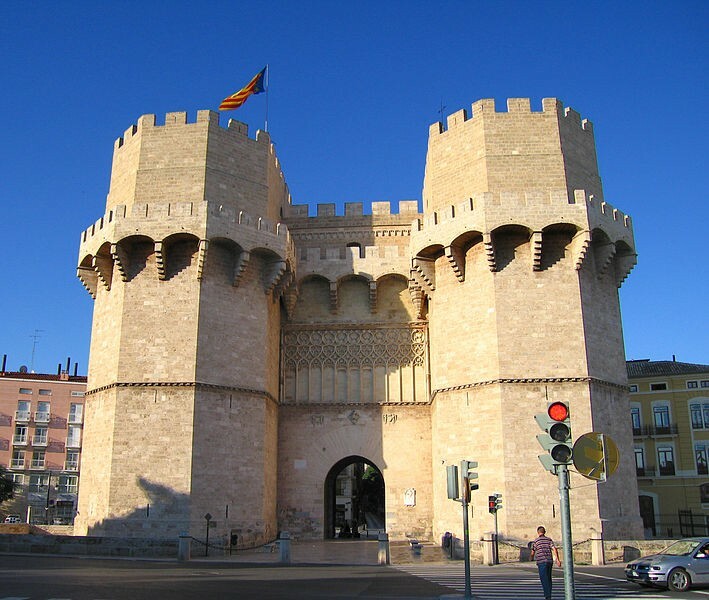 Valencia has an amazing array of ancient and historical places to visit. It is a warm and inviting city beautifully combining both the old world charm and the genius of modern architecture. See below to view a selection of our featured bargain properties in Valencia.